Reading the reviews of this book, there’s a significant subset of people who think that Neal is a bad person, a bad character: he’s holding back Georgie from her career; he’s jealous of her close friendship with another man; he has a tantrum and takes his kids to Omaha without their mother because she’s working on something which could, potentially, be her big break, and can’t go with them. I know there were people who read it as anti-feminism, trying to imply Georgie should have spent her time in the home instead of focusing on her career, condemning her close friendship with a man, etc. As the daughter of a woman with a career and a man who gave up his for me and my sister, I can’t read it that simply. I know exactly how much work my dad puts into keeping the house clean, tidy, and a nice place to live. Neal does that, here, and still finds time to be affectionate to his wife, to play constantly with their children, to do favours for her. And mostly, he doesn’t complain about all the things he has to do. He just wants more of Georgie in his life — to feel like he is her priority, and not Seth. He doesn’t seem to resent Georgie for the fact that he gave up his career for the kids — she didn’t even ask him to, he chose to — and at one point he outright says that if she says that he comes before Seth in her life, he believes her and trusts her, and will not ask her to choose. It is entirely fair for him to ask her to put some work into the relationship too, and not just rely on him to pick up all the slack. It’s not feminism to simply reverse the roles and leave the husband at home, unsatisfied with his life. I honestly didn’t find anything Neal asked for unreasonable, and though sometimes his behaviour was a little over the top, let’s not pretend that people have to be perfect in order to deserve love, respect, and partnership. Taking the kids off to Omaha without their mother was unfair to the kids, as well as to Georgie, and so just came across as spiteful. Sometimes his surliness was very unappealing. But the whole point of this book is about working on a relationship. Making it work. Trying to be a better person, trying to be better to your partner. Owning up when you’ve done wrong. We see more of that from Georgie, because it’s fairly tightly focused on her POV, but in the connection-to-the-past scenes, we see a younger Neal trying to figure it out too. And, as always, Rowell writes well about that connection between people — the physical connection, the closeness, and how gestures of affection don’t have to be stereotyped kisses. 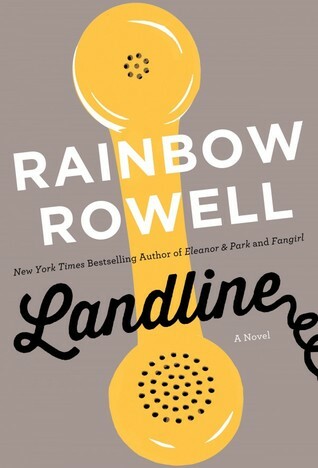 The titular landline is, in fact, just a prop, a way to make the bridge between the characters in the past and present — this isn’t science fiction. It’s romance with a touch of magic. It never gets explained, because it really isn’t the point of the story. You may find that unsatisfying, particularly if you are a fan of time travel stories and the like, but it would be a completely different book if it focused on that aspect (and probably not very characteristic of Rowell’s style). This isn’t YA, like Eleanor & Park or Fangirl, so it is different. It’s a much more adult experience of love and relationships. I enjoyed it quite a lot. I loved this book so much. I didn’t have any of the problems you describe at the beginning, I just thought their relationship was complicated (not more so than others) and because of that very real. That’s what I love Rainbow Rowell’s books for, she is such a pro at portraying relationships and feelings without the usual clichés. Also, have you caught the Fangirl cameo at the end? That me me so happy, even though I only realized what it was days after finishing the book. Yes, I agree. I was a little surprised by the dislike some people expressed! Aw, that’s a shame. A couple of my friends felt the same way, though.